The cat-back exhaust that comes in the TRD Pro is going to make sure you make an entrance. This exhaust pipe creates a loud, raspy noise as it matches the power you put into it. Additionally, its mandrel bends help maximize efficiency. Take one look at the 2019 TRD Pro Tacoma and you’ll notice the all-new TRD Desert Air Intake. TRD’s engineers were thinking about the California desert when designing this TRD Pro model. Crossing the Mojave Desert means mile-after-mile of silt, sand, dust and dirt—and that can quickly strangle a normal off-roader. The solution? Rise above the challenge! So, instead of having its air intake near the wheel well like it usually is TRD brought it up out of the dust line and into clean air—this new air intake system allows the 278-horsepower 3.5L V6 engine to draw air from above the windshield. 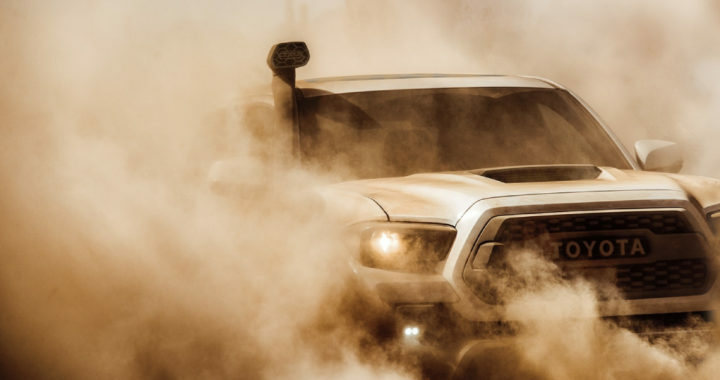 The TRD Desert Air Intake for the Tacoma TRD Pro is designed to sustain consistent off-road performance no matter how silty or dirty the terrain gets, which helps benefit air filter longevity and, ultimately, engine health. The comfort behind the performance. Tacoma TRD Pro comes standard with heated, leather-trimmed front seats so you can keep warm when charging through the snowy wilderness. Open up the power moonroof and bring the outside in, giving you everything from a cool breeze to an epic view of the stars. Headrests embossed with the TRD Pro logo—plus unique TRD Pro floor mats —help ensure that this cabin always looks good. A premium JBL® Audio system makes your playlist sound extra epic, and with Tacoma TRD Pro’s standard 4.2-in. full-color Multi-Information Display, which includes an inclinometer with roll/pitch displays, you’ve got the data you need to take the action beyond the trail. This is hard-core engineering. FOX®-patented Internal Bypass shocks tuned by TRD help give you the ultimate in comfort and control. Designed to handle the high-speed suspension movement common in the dirt, these dampers feature 2.5-in. aluminum housings; hardened, oversize shock shafts; and remote reservoirs in the rear. What’s more, this rugged system helps provide more ground clearance, increased suspension travel, maximum damping, and fade-free performance. The TRD Pros are our flagship off-roaders, able to take you where other vehicles can’t. You’ll love the fact that, for 2019, all three TRD Pro models have 2.5-inch Fox® Internal Bypass Fox Shocks. Here’s the key: Fox provided great off-road shocks, then TRD’s engineers made them better by customizing each set—front and rear—to enhance the off-road handling. Look inside and you’ll find internal bypass technology. These shocks are paired with TRD springs to produce the right “lift” giving these TRD Pros an aggressive stance for improved trail-conquering capability. 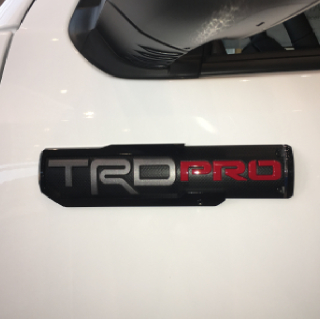 Call me with inquiries on brand-new and Certified pre-owned TRD Pros in Northeast Ohio. 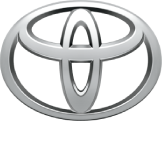 Posted in New Vehicles and tagged 2019 Tacoma TRD Pro for sale in Akron Ohio, new and Used Tacoma TRD Pro for sale in Cleveland ohio, New TRD Pro for sale in Northeast Ohio, Tacoma TRD Pro for sale in Akron Ohio, TRD Pro Cat-Back Exhaust, TRD Pro Exhaust, TRD Pro Newsroom, what does a cat back exhaust do, what is catalytic converter.